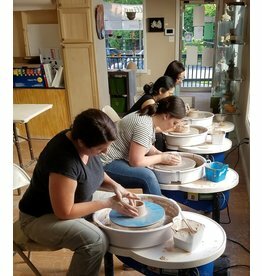 In our classes, you will learn processes and techniques for creating ceramic art, experiencing the whole cycle from soft clay to a finished, glazed piece. 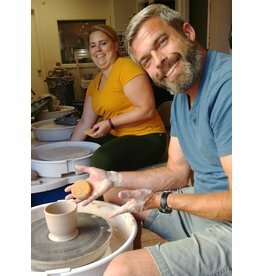 We provide the relaxed environment, use of our tools, up to 25 pounds of clay, plus glazing and firing. 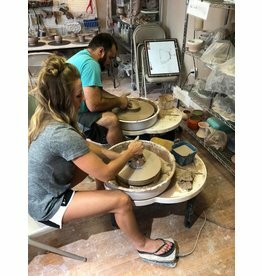 Classes are offered for all levels, with instruction in wheel throwing, hand building and decorating techniques. You will get dirty! Please dress appropriately. A changing area is provided. Classes are limited to 10. Finished projects will be available for pickup throughout the session and within three weeks after the end of the class. 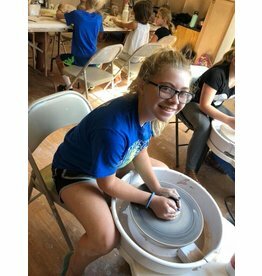 Beginners learn how to use the potter's wheel and intermediate students advance their skills to include larger sizes and more complex forms. Skills covered are centering, cylinders and bowls as well as introductory trimming and glazing. Kids work hand building projects and begin to use the potter's wheel. 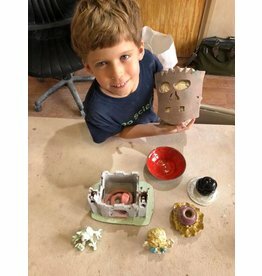 Children are introduced to the full lifecycle of clay from soft clay to the finished fired piece. Work is available to pick up within 3 weeks of the end of class.